Umesh Chaudhari, a forest resources major at UGA, interned with the Athens-Clarke County Leisure Services Department during the summer of 2016. Although he previously did not have experience in county government, he learned much during his internship, particularly about the structure of county government, including specifics on various county departments. Chaudhari said he appreciated the willingness of the staff to teach and work with him during his time with the county. 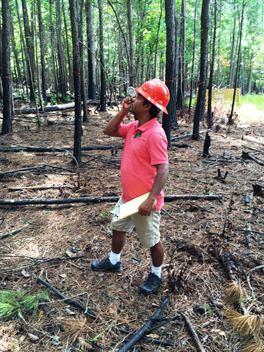 Chaudhari had varied responsibilities throughout his internship working on the department’s managed forest program. Those duties included physical removal of invasive plants, tree planting, trail construction and maintenance, and land management. He also worked directly with staff to create educational opportunities and networked with various agencies to continue proper management of the forest. Chaudhari expressed that his favorite part of the internship was designing a sampling inventory scheme and analyzing the data. Chaudhari found his greatest success to be removing invasive species form the county. He found this work and helping Georgia forests stay healthy the most engaging and rewarding part of the internship. Upon completing his internship, Chaudhari noted that he would consider a career in county government.